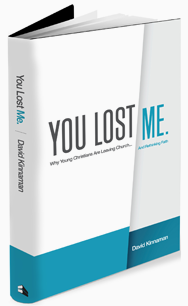 Believing Thomas: Hey Church, You Lost Me! Part 2. "It's not that they're not listening; it's that they can't understand what we are saying." In chapter two, Kinnaman describes how the next generation is living in a new technological, social, and spiritual reality, summed up in three words: access, alienation, and authority. "The digital revolution, endemic social change, and a shifting narrative of faith in our culture have deeply affected the cognitive and emotional process of "encoding" faith. Because of access, alienation, and authority the ability of one generation to convey the message and meaning of faith to the next generation - in thought forms, ideas, and practices they can readily understand and incorporate into their lives - has been disrupted." In 1977, people saw Star Wars repeatedly in the theater, not (only) because they were geeks, but because there was no guarantee they would get to see the movie again. Today, many people "endure" jobs, school, or church and "enjoy" their real lives in online games. Less than one tenth of one percent of consumed information is from a written word. Young adults report high levels of isolation from family, community, and institutions. "Settled by thirty" represents a minority of today's young adults. There is wide skepticism about denominations and church structures. Christianity is no longer our culture's "auto-pilot." The study showed a more positive opinion of Paris Hilton than of Billy Graham among young adults. Christian leaders of the previous generation are virtually unknown to today's young Christians. They are more likely to consult the internet than their pastor about a religious question. Even so, while tech savvy, young adults are not always truth savvy: "I found it on the internet." They are exposed to a variety of religious content, often without a grid for evaluating it. All of this can be seen as a threat or an opportunity. And it is both. Our worship practices tend to involve either a pastor leading something or everyone joining together for singing or corporate reading/prayers. There isn't much room for individually-shaped worship (perhaps at the communion rail, the only place in our worship where you can choose to extend or shorten the experience!). The theology that informs our worship emphasizes the community over the individual, even giving creedence (pardon the pun) to ancient practices and creeds that link us to the historical body of Christ. All of this, plus our emphasis on the written words of scripture and liturgy (based on scripture), requires a "cultural commute" many young people are not apt to make. We've been hard at work in recent months to address the gap of young adults in our church. One of the obstacles is the assumption that a high school graduate will move smoothly into the many opportunities for adults, men, and women. This is not the case. Kinnaman's work has been very helpful in framing our Young Adult group conversations. It is clear that many feel alienated from the ways of doing and being church passed down by older generations. I serve a denominational church, part of the Evangelical Lutheran Church in America. There is almost zero denominational loyalty among younger generations, but high relational loyalty. I'm ok with this. Martin Luther himself criticized his opponents for their obsession with the church - "The church, the church!" over against the authority of the Gospel. I'm particularly interested in what Kinnaman describes as a "grid for evaluating" religious content. While de facto authority is questionable, I do feel young adults appreciate leaders who provide context and perspective from a generous and humble posture. How about you? Where do you observe the language gap between things the church says/does and what young adults hear?